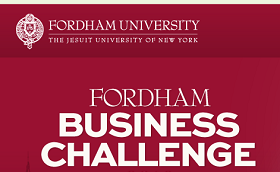 The Fordham Business Challenge is back, and better than ever! Here is your chance to be in the heart of New York City! Apply for the Fordham Business Challenge 2014 and win a full-tuition scholarship for a specialized Master of Science program at Fordham Graduate School of Business in NYC fall 2014. Don’t miss out on this exciting opportunity that will take you to the business, finance and media capital of the world—New York City! Open to college seniors, recent grads and young professionals WORLDWIDE! SOUNDS GREAT! WHO CAN COMPETE? Undergraduate seniors who will obtain their Bachelor’s degree by June 2014 or recent graduates and young professionals holding a university diploma WORLDWIDE. Students from any discipline are welcome to compete. YOU can study in the global business and media capital of the world – New York City! There is a program for everybody! Study Engineering? Check out the MSBA and MSSD programs. Want to earn two degrees while traveling the world? The 3CMGM program is just for you. Read about all 5 programs at www.fordhambusinesschallenge.com (active link is below) and find the one that is right for you! Apply for the Fordham Business Challenge 2014 and compete to win one of 5 available full-tuition scholarships to study a specialized Master of Science program at Fordham Graduate School of Business Administration (GBA) in New York City fall 2014. Over $200,000 worth of scholarships! This scholarship award completely covers all tuition, i.e. full-tuition scholarships, for the successful applicants. You need to visit the official website at www.fordhambusinesschallenge.com (active link to it is below) and take the challenge by answering (3) multiple-choice question sets and (1) essay question. The Fordham GBA offers students from around the world the opportunity to study in the heart of New York City while being part of a vital and exciting community. Fordham GBA is currently ranked among the top 25 business schools in the U.S. in Finance, Marketing and Management. Because of our strong alumni network with leading business professionals, our committed faculty and an active student body, Fordham GBA will equip you in the best possible way for a successful career. Attending Fordham GBA at Lincoln Center is a true New York experience. Our campus is located in vibrant midtown Manhattan, near Central Park and Times Square and is a short subway ride to Wall Street. As an international center for both culture and commerce, New York City has no equal. It is here that many of the nation’s most ambitious young men and women come to make their mark in the arts, communications, business, finance, education, fashion, publishing, science, social science, the law, and international politics. Since its founding, Fordham Graduate School of Business Administration has been a vital part of this exciting city, offering its students an education that is equally as stimulating – as well as personally and professionally fulfilling.